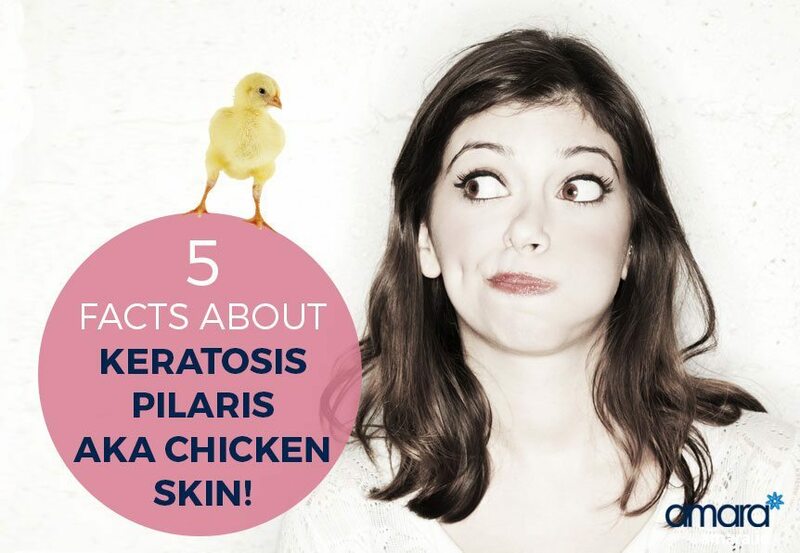 5 Facts About Keratosis Pilaris AKA Chicken Skin! Many of us suffer from red (or white) bumps on our arms which is Keratosis Pilaris more commonly known as chicken skin. Though unsightly keratosis pilaris is very common and harmless. However most of us are unsure about keratosis pilaris and this not knowing can actually make it worse. In this post we’ll give you 5 facts about keratosis pilaris that you might not know! Unfortunately keratosis pilaris (KP) can’t be cured! However it is completely harmless and can be kept under control. We’re not sure exactly what causes keratosis pilaris but we do know it is an overabundance of keratin that causes the hard goosebumps to appear. Keratin is key in the make up of our skin, hair & nails and also protects our skin from stress. It’s likely that one of your parents had or has keratosis pilaris and you inherited it from them. You may then think then why they don’t have it now? Which is a good sign! Keratosis pilaris tends to get better with age however we can make it worse by treating it incorrectly and damaging our skin which causes scarring. You’re Probably Making Your Keratosis Worse! When we see these little bumps we tend to think “scrub them off!” but over exfoliating actually irritates them and encourages them to keep coming. Hot showers and baths also irritate the bumps causing them to become red and irritated. Tight clothes can also cause friction and irritate them causing flare ups. Stick to warm showers and try to avoid baths. Use a good moisturiser (preferably a retinoid like Oraser Body Emulsion Plus from Dr. Zein Obagi) and avoid over exfoliating as this will cause them to recur or even become worse. When keratosis is on our cheeks it can sometimes be confused with acne or rosacea. You probably feel a difference in your skin during the changing seasons so it makes sense that your keratosis pilaris would change depending on the weather too. During the winter our skin can get dryer with the changing weather and use of indoor heating. The heating and layers we wear aggravates our skin causing the bumps to appear more red and harsh. Though keratosis pilaris is medically harmless the severity can change for every person and it can be be something that people struggle with. Keratosis pilaris treatments vary from person to person and if you are struggling with keratosis then contact our skin health specialist today by calling +353 1 676 1074 or contact us online to see how we can help.